When you think ‘Time Square”, what is the first thought that crosses your mind? There’s no doubt that New York immediately comes to mind. And why wouldn’t it! New York City’s Time Square is a well known landmark around the world. However, there is another Time Square only known to the locals. 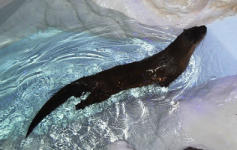 It resides in Southwest Florida on the small island of Estero in the town of ‘Ft Myers Beach. 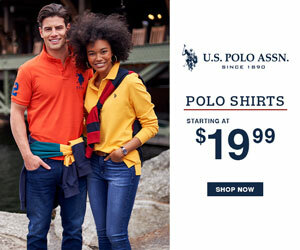 Anthony here with the travel site “You, Me and The Dock”. 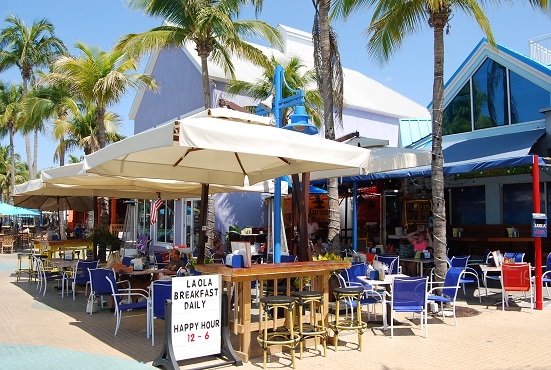 I will be your guide today taking you in and around Ft Myers Beach’s Time Square. We will also explore the pier with its views of the beach and the vast Caribbean fed water. Unlike its epic namesake in New York, this Time Square is much smaller in size. It encompasses approximately a small island city block – from 5th Street and Old San Carlos Blvd to where (new) San Carlos Blvd rounds into Estero Blvd. 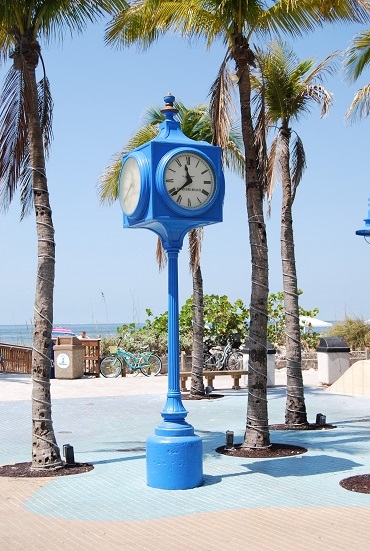 This quaint island attraction host a variety of street entertainers, local musicians playing under the designated square’s clock, and vendors offering kids face painting and other family fun. During the 4th of July and New Years Eve, everyone gathers around to watch fireworks being shot off from the pier’s edge and out over the Gulf of Mexico. 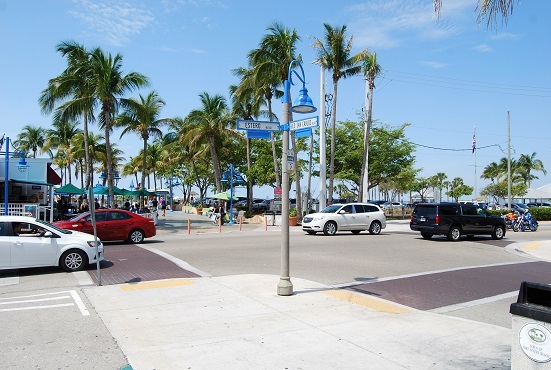 From this point – shown right, we are standing on the corner of 5th and Old San Carlos Blvd looking west – towards the Gulf waters, and the entrance into the Square. Most of Time Square’s restaurants and bar & grills are home grown like ‘Bella Mozzarella Pizza & Grill’. 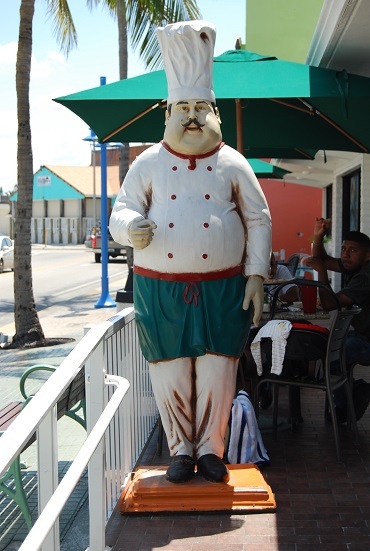 Their chef’s likeness stands at the squares entrance welcoming visitors. From here we proceed down the pedestrian friendly walkway. Hopefully it won’t be a very busy morning. But you never know how many people the gorgeous weather and beautiful beach will bring out on any given day. Most if not all the eating and beverage establishments offer patios with views. 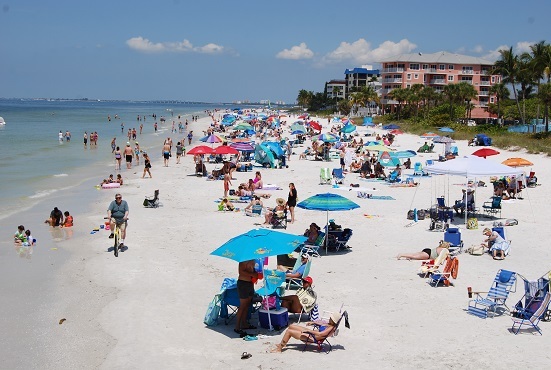 SW Florida can get rather hot and depending on the time of day, you can either enjoy an air conditioned room or a patio with the sea’s salty aroma swirling all around. I would suggest when on the water, select the patio whenever available. You might sweat a bit, but the views are well worth it. The sign – shown left, says it all. 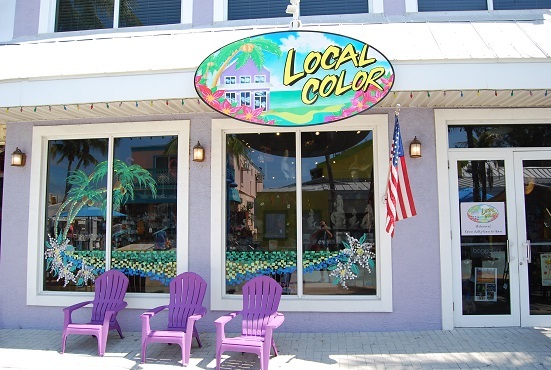 There is no shortage of vivid colors anywhere on Ft Myers Beach and especially in Time Square. 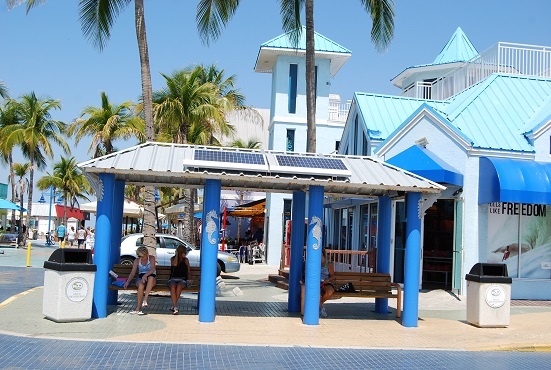 There is a convenient trolley stop on the north end of the square for easy access to anywhere on the island. Why deal with the traffic and parking issues? Simplify your island experience and use the trolley. There is one notable feature here that you won’t find in New York’s Time Square and that is palm trees – at least real ones. 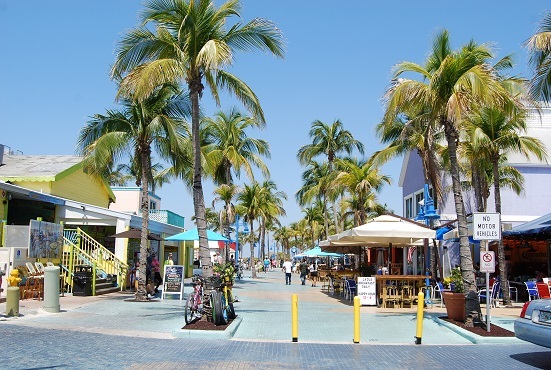 Ft Myers Beach is known for its picturesque palms, colorful structures and light aqua blue pavered walkway. Latitude is everything! Lets continue our tour towards to pier. The views are truly spectacular. 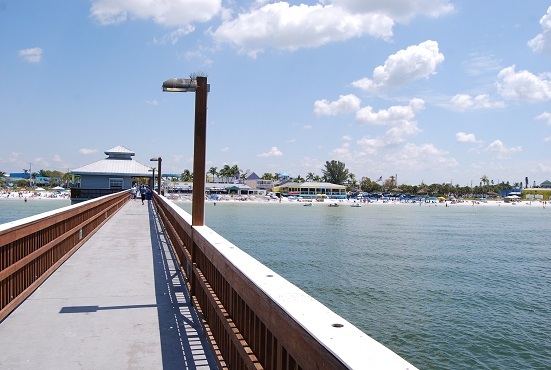 As we travel down the Ft Myers Beach pier’s narrowed planked walkway, you have a 180 degree view up and down the beach. The sugar fine white sand is blanketed with sun worshipers, sea lovers, and day going individuals who just like being outside. I couldn’t think of a better way to spend the day and neither can the tens of thousands of annual visitors as well. 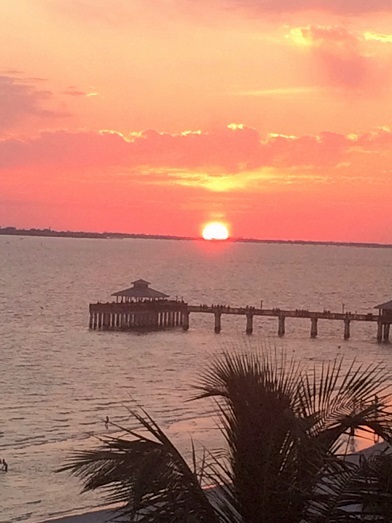 The 560 foot pier extends out into the Gulf waters. it provides a perfect platform for the avid fishermen who toss their lines out into the emerald colored waters. 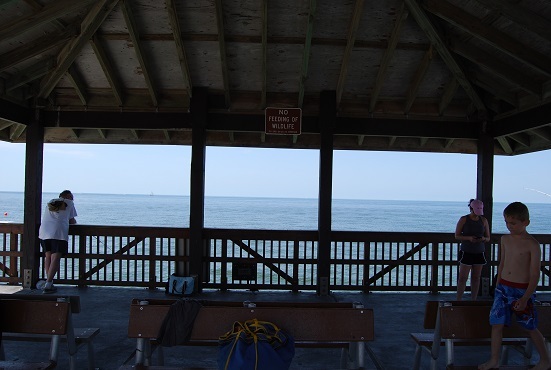 You don’t have to be a fishermen to enjoy the pier’s covered observation deck. There are plenty of people who walk the lengthy stretch to view the open water and the blending horizon. Watching the sunset from this advantage point is extremely beautiful. I ended up sitting for awhile to take in the endless views. 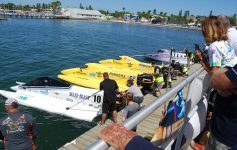 The mixture of activity that surrounds the pier’s broad point, adds just that much more to the ambiance. With the help of ‘You, Me and The Dock’, I have produced a video of today’s tour. 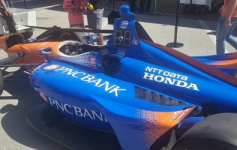 It gives a visual sense of everything in the article and more! Its not perfect by any means and isn’t intended to be. But we think you will be pleasantly surprised with our unscripted dialog and off the cuff filming. 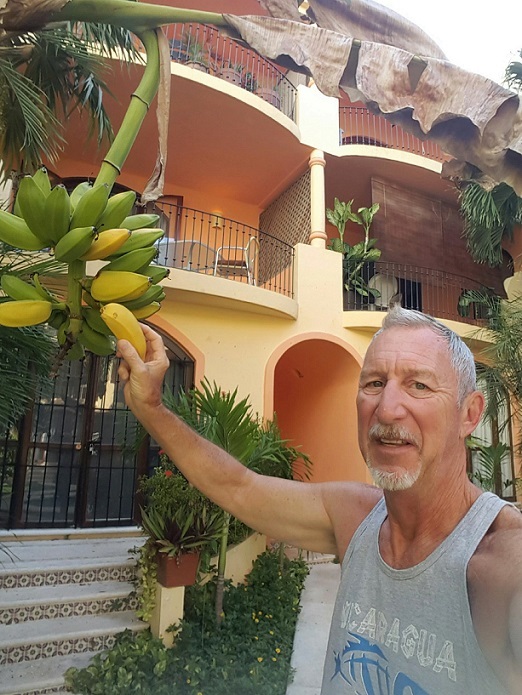 On behalf of myself and the travel site, we truly hope you have enjoyed our little adventure. We appreciate you following along with us and hope to see you soon!